Over this last year, the IES have focused attention on extending membership to all levels of environmental scientists. By breaking traditional tropes that science is reserved for professional academics or postgraduates in white lab coats, the IES has acknowledged that science is founded on the collaborative efforts of researchers, regulators, practitioners, educators and technicians, the latter of which can often feel disenfranchised by the wider community. To aid this goal, the IES have launched this summer the Registered Environmental Technician (REnvTech) registration for their members, in recognition of the value, expertise and contributions that technical professionals provide to the environmental science sector. 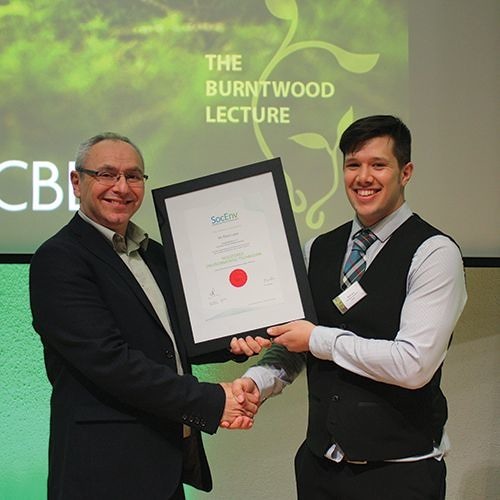 At this year’s Burntwood Lecture, ‘Can we put a price on biodiversity?’ delivered by Professor Kathy Willis CBE, the IES proudly presented an award to their first REnvTech. Mark Lane, a Graduate Consultant within the Sweco remediation team, was the recipient in recognition of his fantastic achievement. Mark had travelled all the way down from Edinburgh to receive his award, and was warmly welcomed by IES Chair, Gary Kass, who presented the award. Upon receipt, Mark was asked what the REnvTech award meant to him and his career. Listen to his response in the recording below.